Put it on the cereal, mix the cereal in, and eat it. “Yogurt on my cereal?” you might say. “I haven’t tried that.” I know. You should. It’s a creamy treat and protein packed—provided you select the right yogurt. “Yogurt seems weird on my cereal,” you might say. Let me ask you a question: Are you mixing the cereal into the yogurt before you eat it? That’s an important part of achieving a smooth and pleasing texture and eating experience. Once you have the hang of that, let me ask you another question: What kind of cereal are you mixing with this yogurt? Let’s get down to brass tacks and address the elephant in the room. I am in the business of recommending new and ingenious food combinations to the public. 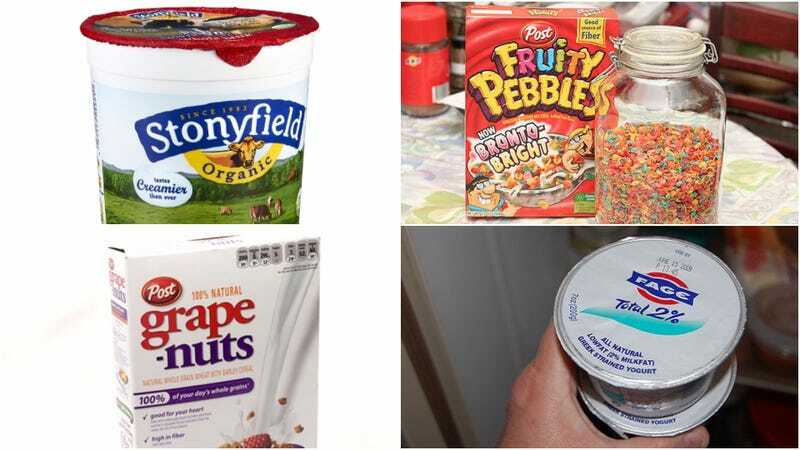 I am not in the business of “calling you out.” But I know for a fact that there are those in this world, who shall not be named, who will react to the idea of yogurt on cereal with the expression, “Yuck.” I also know for a fact that many of these very same people have eaten and enjoyed the now-classic breakfast combination, “Yogurt and granola.” To them I say: Guess what granola is, my friends? Some may find it necessary to add honey if they choose a non-sweetened cereal. I cannot make that choice for you.